Before I start, I want to take a moment and discuss what I find utterly incomprehensible - it is likely not what you think it is. 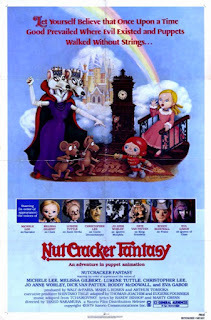 For example, as strange as it is that Sanrio, the Japanese company best known for Hello Kitty, produced a 1979 stop-motion fantasy movie re-imagining the Nutcracker as a dark fantasy in the vein of Oz and Wonderland, it's not incomprehensible. What my rational mind cannot accept is the idea that this was made, shown in America with an audio track starring Christopher Lee as Drosselmeyer, and then was inexplicably forgotten. 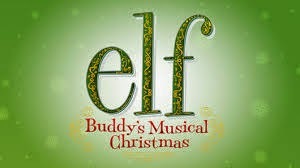 Why isn't this at least as well knows as Rudolph's Shiny New Year? It's ten times as batshit crazy. The plot stays relatively close to the original story; closer, in some respects, than Tchaikovsky. That said, there are some major deviations. For example, neither E.T.A. Hoffmann's Nutcracker or Tchaikovsky's involved time-travel. However, it's worth noting the addition actually cleans up the narrative a bit. This one's short - very short. And that's a shame, because I could really watch hours of this. 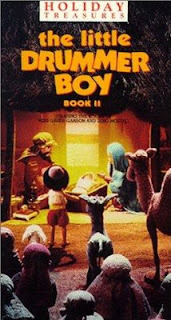 It features very fantastic character design, beautiful stop-motion animation, and an awesome spin on Krampus. The short is between 50 seconds and five minutes long, depending on how many times you re-watch it. Enjoy! 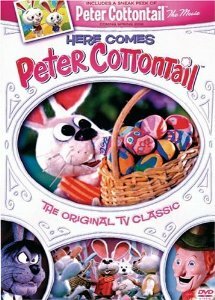 I'm pretty sure Here Comes Peter Cottontail represents Rankin-Bass's first attempt to push into a holiday other than Christmas. This largely forgotten artifact features Danny Kaye as the narrator (as well as a handful of other voices) and Casey Kasem as the title character, which means you'll spend most of the special expecting Peter to ask for a Scooby snack. No, that's not quite right: you'll probably spend most of the special looking for a ledge to jump off of. But you'll also notice that the main character has Shaggy's voice. 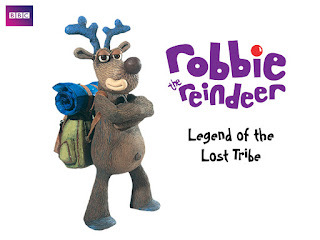 When we last left Rudolph, Christmas had been narrowly saved from destruction, and he was returning to the North Pole along with Santa and the other reindeer. 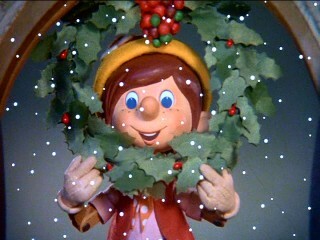 Of course, when we last left Rudolph he also had a full set of antlers and was more or less grown up. 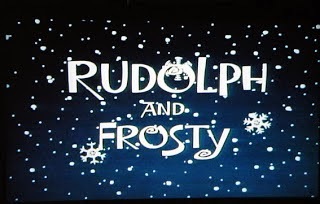 Rudolph's Shiny New Year opens on the same Christmas Eve but with a younger version of Rudolph, presumably because the producers thought kids would have an easier time associating with a talking deer closer to their age. Well, it turns out all is not right. 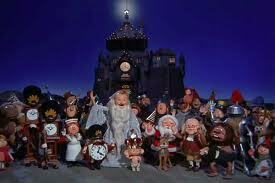 Christmas may be saved, but they hear Santa's old friend, Father Time, is in trouble. That's right: now New Year's Day is in trouble. For some reason I can't fathom, they care. See, I get wanting to save Christmas: it's when we get presents. But New Year's? Who gives a damn? What's next? Are they going to risk their lives to make sure Arbor Day isn't ruined? We got a tip (thanks, Mom!) that this new special was going to be airing on network TV, so we sat down to check it out. 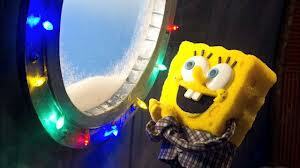 Now, I’m only passing familiar with Spongebob, although that’s more than Erin is. My takeaway from this is mostly that I respect the attempt, but don’t think it fully came together. Maybe it’s funnier if you know the show better. 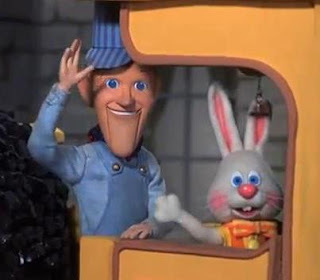 This episode was entirely filmed in stop-motion, and the effort is appreciated, although it’s not an unusual choice these days when one wants to evoke the feeling of Christmas specials past. (See Abed’s Uncontrollable Christmas for a better example.) However, I’m not sure all the character designs really make sense in three dimensions, particularly when they tried to replicate some visual tropes of the usual animation. The sets were neat, though, and while I didn’t ever think the voices completely matched the fuzzy little dolls, the aesthetic of the thing overall was kind of cool. 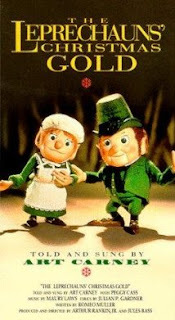 I can't remember ever hearing of "Bump in the Night," but Lindsay swears it was popular in its day. 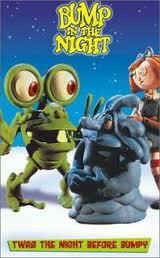 It was a stop motion series from the mid-90's about a monster named Bumpy and his friends. 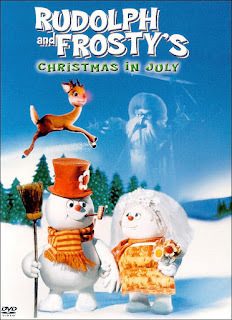 We wound up getting the hour-long Christmas special on the "Christmas Cartoon Collection" DVD Lindsay found for six bucks at Toys R Us. Calling this bizarre is an understatement: it's one of the strangest Christmas specials I've ever seen... and that's saying something. 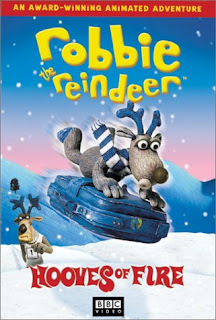 Bumpy sets out on a quest to steal Santa's sack of gifts from the North Pole. 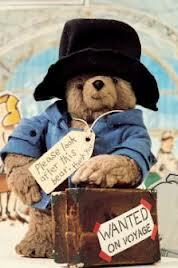 On the way he manipulates others into assisting him by promising them presents. The animation is impressive. It's warped and twisted, as is the writing. The jokes are farther apart than I'd have liked, but most are clever (some were exceptionally so). Ultimately, we're left with something mixed. It has an amazing tone thanks to a shockingly dark sense of humor, but the pace is way too slow. I'm not sure whether I'll be able to coherently describe what happened in the special, but I know I can explain how it came to be. There was a meeting, quite possibly in a studio boardroom, where someone said, "Hey. You know what we need? Another Rudolph." To which someone else added, "And we need something that's religious, really puts the Christ in Christmas." And fifteen minutes later the storyboard for Nestor: the Long-Eared Christmas Donkey was born. I don't think I've ever seen this before, probably because it doesn't have the same exposure most of the other specials have. This is kind of a shame, because it's just about the most screwed-up thing I've ever seen, and I feel like more people should be familiar with it.